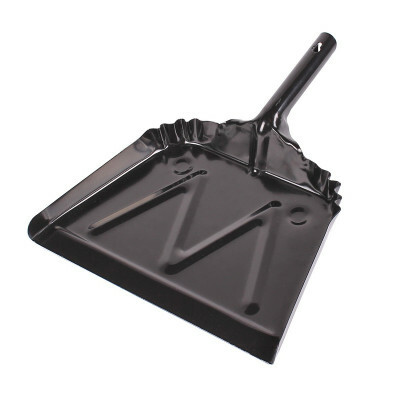 This highly durable metal dust pan is manufactured with a thinner front edge for improved dirt pick up, and is ribbed for added strength, which makes it more durable than some of our other dust pans. It is twelve inches wide for an extra wide coverage path, and it is powder coated for longer life. The metal dust pan works exceptionally well with our yellow corn sweeeping broom. Customers who were interested in the Black Continental Heavy Duty Steel Dust Pan were also interested in the following items. This is a review for the Black Continental Heavy Duty Steel Dust Pan.